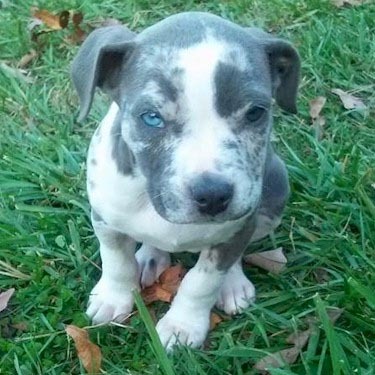 Merle is a genetic trait that leads to splotches of darker color on patches of lighter color, ticcing, and the development of blue eyes. Genetically it acts as a diluter so it will typically dilute the primary color or pattern of an animal. When white is a primary color a Merle will typically present itself with heavy ticcing. While it is known to be genetically related it has eluded scientists' ability to pin down specifically. It was originally thought to be a specific gene but this has since been re-thought, as it now appears that it may actually be a combination of genes acting together and thus the reason for eluding specific detection. This also explains why the previous theory of it being dominant and unable to hide or skip generations has now proven to be false since several examples of generation skipping have been recorded. While some people like to try and down play the existence of Merle in the purebred Pit Bull's history this is futile, insincere and selfish as it has been historically documented since the inception of the breeds first official recognition as a breed. 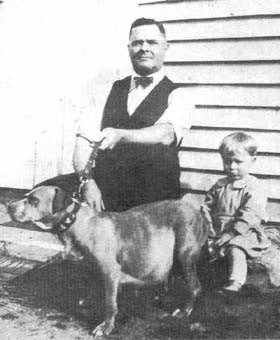 Many prolific and well-known dog men in the history of the Pit Bull including John Colby himself kept and bred Merle Pit Bulls. This is photographically documented in Louis Colby's book "Colby's Book Of The American Pit Bull Terrier" as the very first Pit Bull illustrated in the book under the name "Goldie" documented to the year 1922 on page 3. In this picture John sits with his son Louis and a pregnant Goldie. Other examples of Merle are subsequently documented in other books such as those by Richard Stratton. Many of those who today try and debunk this historical evidence of Goldie will often try and confuse the topic by saying that the Pit Bull listed is "Colby's Goldy" when it clearly is not. It is inconceivable that Louis Colby would not only make such a mistake in the very first picture in his book but that he would keep it there through numerous revisions. In our correspondence with Louis himself during his life he stated "Richard Stratton a friend and author of several dog books, once told me, 'If you find an error in your book, correct and initial it, thus making that copy of the book more valuable.'" In the personal copies he provided to the APBR he made no such correction on Goldie nor did he make the correction in commercial prints in future revisions. It is clear both by Louis Colby's actions, historical documentation and photographic analysis of the true Colby's Goldy against Colby's Goldie that these two are in fact separate and distinctly different dogs. It is interesting that when Merle is brought up that the naysayers will ask that photographic evidence be provided. When such evidence is however provided they then will back track and make excuses like that the obvious Merle pattern is caused by things like shadows from trees or will say that it can not be relied on because the photograph is black and white, as if any pictures from nearly 100 years ago were anything but black and white. These desperate attempts show the insincere and selfish motives of such individuals. It is obvious that those who are bias against purebred Merle Pit Bulls will say anything to deny what is historically proven. 14 years after the picture of Goldie was taken the first written standard commissioned by a registry on the breed was officialized, which clearly stated in relation to color/pattern that "Any color, solid, parti, or patched is permissible" and that the next written standard by another registry clearly stated "Any color or marking is permissible." It is amusing to think by some peoples accounts that these registries did not understand what they were saying when they said "ANY". It is also amusing that these same individuals are the most ardent supporters and brand loyalists of those same registries today. 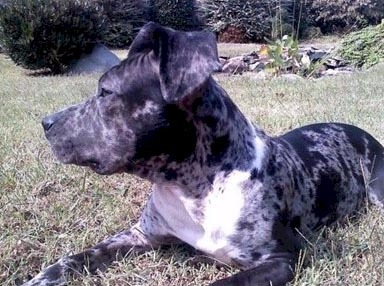 Subsequent statements by another well known registry still states they recognize "the fact that dogs with this merle color pattern were present in the breed, but they were not identified as 'merle'." This registry to this very day will register the non-Merle offspring from an otherwise Merle litter thus further validating their belief in its purity to the breed. At the APBR the historical evidence is clear Merle is, has and does exist within the purebred Pit Bull. 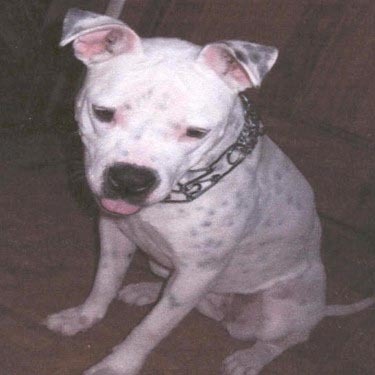 So why do some registries "NO LONGER" recognize the Merle Pit Bull after nearly 7 decades of accepting it? The answer is quite simple that it is on the shoulders of a few power players within those registries and the industry itself that have held sway over these registries due to their own personal bias and motives. The primary individual that has caused the greatest confusion is a known advocate of inbreeding, which is awful ironic as every single health issue that was attempted to be placed on the Merle is in fact scientifically proven to be related to inbreeding. In a position statement put out by this individual about Merle he refers to others who state also obvious but recognizable opinions about the Merle Pit Bull as "possibly" being mixes. While it is obvious that these individuals have no experience with Merle their opinions have been contorted and construed by others today, who are also bias, as being undeniable truths without need of evidence. Let us play devils advocate and say that some Merle was introduced to Pit Bulls this in no way would discount the history of known purebred Merles nor would it be just cause to remove all Merles. If this were the case and de facto standard of practice then no breed would exist because all breeds have had mixes. This is in fact what makes up the mix-bred population of dogs today. It should also be noted that the UKC now admits that much of the Pit Bull line has been polluted by other bully breeds and this is in fact now the origination of much of the American Bully class. If the honest standard is removal and not politics or financial motivation then all the known American Bully lines would subsequently also be removed from the Pit Bull studbooks of the UKC. The UKC however realizes this is an impossibility since the American Bully lines have now been linked to just about every modern day pedigree in current existence to some level. This leaves but one rational conclusion the mixing myth has nothing to do really with the removal of recognition. As previously mentioned health claims have been made against the Merle Pit Bull that have yet to be proven true. All such claims that have been made however do show the same exact effects as inbreeding. Claims of diminished hearing, blindness, skin disorders and a myriad of other false accusations have never been scientifically proven to be specifically linked to the Merle trait. These claims are merely conjecture, opinion and in many cases intentional misrepresentation in order to use the Merle as an escape goat for what seems to be the obvious culprit for such conditions. For those entrenched in such irresponsible breeding practices it seems they find it easier to try and distort reality than actually making a change to a more positive breeding practice. 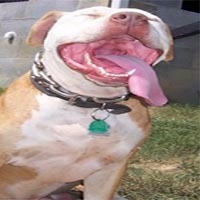 Since 2005 The APBR has taken the responsible role of separating out fact from fiction in the many claims made against the purebred Merle Pit Bull. In this study we have poured over numerous written and photographic evidences and have studied literally hundreds of Merle Pit Bulls to determine if there is any possible legitimacy to health related claims. In our decade long study we have determined that when responsibly bred and inbreeding as a factor has been reduced then the Merle Pit Bull has NO PROVEN INCREASE in potential health issues above that of the normal Pit Bull population. It should be noted that it is known that Merle is a genetic trait that acts in a diluting manner. As such when breeding Merle it is highly advised that it be bred to other non-Merles due to risk of double dilution. Some breeders have reported success in breeding Merle to Merle with greater percentages of Merle offspring but this should be considered risky and one who does such needs to be willing to accept and deal with any potential negative outcomes. All breeding has its risks. It is how a breeder manages the risks and outcomes that separates them as being responsible vs. irresponsible breeders. Additionally in our research study we have been able to debunk the theory of Merle being a single dominant gene that will always reveal itself in a breeding. We have evidenced in our study several occasions where the trait has in fact skipped generations to reveal itself later. Because of this it is easy to see how the genetic trait has been able to survive in many cases undetected through multiple generations. 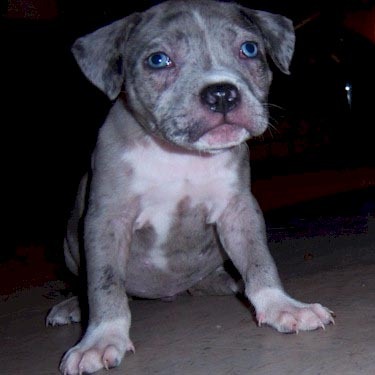 While other registries choose to be discriminatory and play politics with the Pit Bull the American Pit Bull Registry believes it has a higher calling to not only support its members and the purebred Merle Pit Bull but to also protect the entire historical lineage of the breed in all forms. The APBR does not believe it is ethical to try and re-write history simply based on personal bias. Just about every line within the Pit Bull breed has come under attack at one time in the breed's history. If those who attacked it were allowed to succeed the Pit Bull would now be devoid of reds, whites, blues and Merles. This means the breed itself would be on a strong trajectory of complete homogenization and given enough time would be completely homogenized the same as other breeds have now become like the German Shepherd. At the APBR we believe true Pit Bull enthusiasts and owners are proud of the diversity the breed has as is evidenced in their selection and breeding. In a nation that prizes its freedom it is simply inconceivable that anyone with good and honest motivation or intentions would seek to deny another individual of their choices. This is simply un-American. The APBR respects every Pit Bull owner's rights of choice or rights to choose not to own a specific line and feels that there is no room for those who wish to deny this right to others. If you like Merle then great. If you do not great, no one forces you to own one, nor should you seek to deny others of the opportunity.